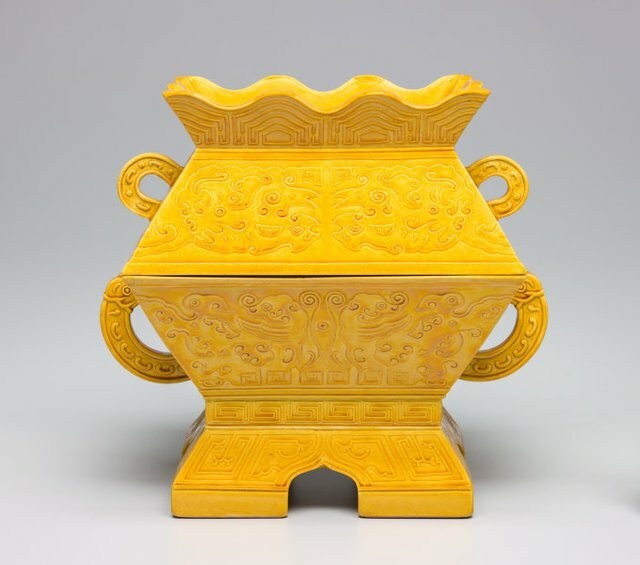 The Asian collections at the Art Gallery of New South Wales include several highly distinctive Qing Dynasty imperial monochrome ceramic ritual vessels made in the 19th century for the use at Beijing’s Altar of the Earth. Beijing’s Altar of Earth was established in 1530 by the Ming Emperor Jiajing (r.1522-1566). When the Ming emperor Yongle (r.1430-1424) planned the city in the early 1400s, all state rituals involving heaven and earth were intended to be conducted at the Altar of Heaven and only subsequently were the separate altars we see today constructed. The north facing two-tiered Altar of the Earth is a square platform surrounded by a moat and enclosed within a double wall, all conforming to a complex web of ritual, custom and regulation. This set of requirements determined everything related to rituals, notably the colour, form, number and position of sacrificial utensils. Tiles on the walls surrounding the Altar and on the roof of the ancillary buildings should, like the emperor’s robes and ritual ceramics, all be yellow, the colour of the soil. All the numbers used in measurements and elements of the Altar are even, yin, numbers. Sacrifices at the Altar of the Earth took place on the summer solstice, the 21st day of the 6th lunar month when the yin forces were in ascendant with shortening days. They involved prayers written on yellow paper, specially slaughtered animals and yellow ritual silks, all of which were buried at the conclusion of the ceremony. The character of the imperial worship at the Altar of the Earth involved worshipping the spirits of the mountains, rivers and seas. The first Ming Emperor, Hongwu (r.1368-1398) decreed in 1369 that ceremonial vessels used in state sacrifices should be made of porcelain, rather than gold, silver and bronze which had, until that time, been the case from antiquity. It appears that this change coincided with an increase in the number of ritual utensils required and made the time and cost of producing vessels less onerous. The Ming records, in particular the ‘Da Ming Huidian’, compiled in the 16th century used - Bian, Deng, Dou, Fu, Gui, Jue, Xing, Zhan, Zun – generally drawn from archaic bronze vessel shape names. Apart from Jue and Zun, no examples of the Ming Dynasty ceramics conforming to these shapes are known. Research based on diagrams in the ‘Da Ming Huidian’ now proposes that during the Ming Dynasty, the Bian, Dou, Fu and Gui archaic shapes were replaced by plates or dishes and the Deng and Xing with bowls, whilst the traditional shape names were retained. Ming Dynasty records also confirm that there were strict regulations regarding the choice of colours for these ceramics. Colours were assigned to the different principal altars: deep blue for the Altar of Heaven, yellow for the Altar of Earth, white for the Altar of the Moon and red for the Altar of the Sun. The unique monochrome ritual vessel forms we see today first appeared during the high Qing, when Emperor Qianlong (r.1736-1796) was in the midst of a campaign to rebuild and refurnish Beijing. Qianlong supervised over many years a review of the state ritual system, regulating important aspects including the ritual utensils. This work culminated in the Illustrated Regulations for Ceremonial Paraphernalia of the Qing Dynasty, printed first in 1766. The regulations set out in great detail not only the sacrificial vessels, but also the costume and jewellery, musical and astronomical instruments, flags and banners and even weapons involved in state rituals at many altars, temples and palaces, including the Altar of the Earth. The Regulations also describe the ceramic utensils to be used at the Altar of the Earth. ‘Fu’ described as a covered rectangular and angular straight sided vessel, whose cover can stand on its wavy flange, was to be used for cereal offerings ... According to the Regulations, yellow coloured ritual ceramic vessels were not used exclusively at the Altar of the Earth. This helps explain why today, the yellow coloured vessels are by far the most often seen. On the other hand, red colour vessels of identical form and decoration, made for the Altar of the Sun are extremely rare. During the succeeding reigns of the Qing Dynasty, it appears from surviving examples that the court in Beijing ordered new vessels only to replace those lost or broken over the years, rather than to mark the enthronement of a new emperor. Consequently, while many examples of monochrome ritual ceramics are marked Qianlong and examples of all shapes can be found today with Qianlong marks, complete sets of vessels from the succeeding reigns are unknown. This family of highly distinctive monochrome yellow, ritual ceramic vessels made for ceremonial use at the Altar of the Earth in Beijing helps draw us into a web of Chinese history and culture stretching back into antiquity, with links and connections, references and allusions beyond imagining. Excerpt from Ian Clark, ‘Beijing’s Altar of Earth and its ritual ceramics’, TAASA Review, vol. 18, no. 2, 2009.